The Consumer Price Index (CPI) decreased by 1.4 percent, before seasonal adjustment, during the 12 months ending in June, according to data released this month by the Bureau of Labor Statistics. The 12-month rate of price change was also negative in March, April, and May - and the rate of decrease has accelerated each month. The major factor is the sharp decrease in energy prices compared to their level a year ago. Even though energy prices rose more than 7 percent in June, they were still 25 percent below their level in June 2008. Hmmm. 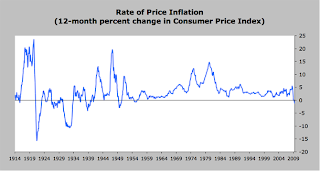 CPI goes down because energy prices are down (presumedly because of the economy being in recession.) But the CPI will turn around when we begin to emerge from the recession and energy prices will go back up. If the recovery is robust, price increases generally will be robust, and at the least we will have demand-driven inflation. But that sort of inflation will probably be on top of the inflation driven by our deficits. Yet, as I understand the left, it is not important for us to have a national energy policy that will develop our own oil and gas reserves. I presume, then, we are to deal with the increase in energy prices by driving tiny cars produced by GM and Chrysler-Fiat.